It’s the Hat KAL/CAL for Hope. Last September, my dad was diagnosed with cancer. 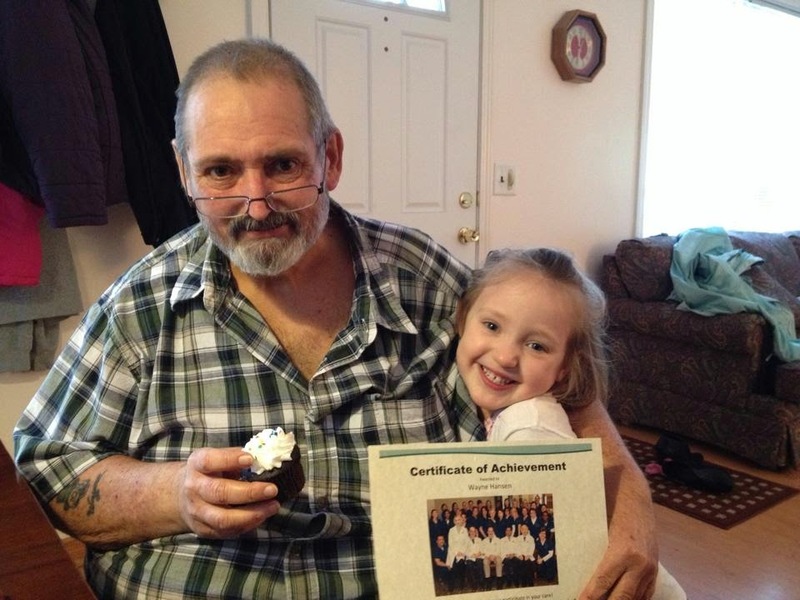 Thankfully after surgery, chemo and radiation I’m happy to say that he’s 100% cancer free! Yay! During many trips to the cancer treatment hospital, I noticed the baskets of hats for cancer patients. It made me so happy to see the hats made by knitters and crocheters all over the country. The one thing I did notice though – many of them were more female-friendly. So it got me thinking – why not run a KAL/CAL collecting more gender neutral hats! Seems like a fun idea to me. 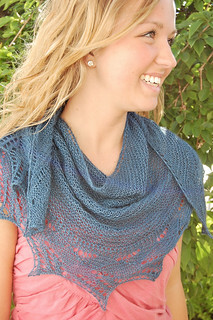 From June 16 to July 18 (that’s 5 weeks) I’ll be running a KAL/CAL here in my Ravelry group. You can use any pattern you want. I would like to collect as many adult-sized gender neutral hats as possible, but will certainly take whatever you want to knit and/or crochet. Once your hats are complete, you can mail them to me. Please ship them by 7/18, so they have time to get here before Stitches Midwest, where I will donate them to Halos for Hope. Because they are being sent to a PO Box, please send them regular mail. UPS/FedEx will not send them to the PO Box. When you mail them, please include a note with your Ravelry name, so I know who sent them. Why do I need your Ravelry name? Because there are going to be prizes of course! My goal is to get 100 hats for Stitches Midwest. Think we can do it?? You can get more details in the thread in my Rav group. Hope you can join us! Sometimes when you enter a yarn shop or market at a convention, there’s that yarn that just speaks to you. The yarn you can’t live without. That’s what happened to me and the Qiviut Royal Blend yarn at Stitches Midwest last year. I just couldn’t leave the market floor without it. I knew that I would make it into a shawl one day, but needed time to think about what I wanted this shawl to be. Finally, Coldspring entered my mind. 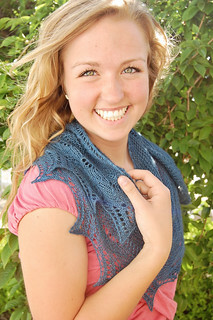 My love for garter stitch paired with lace runs deep, and the combination is perfect for this yarn. It’s delicate, interesting and fun to knit! 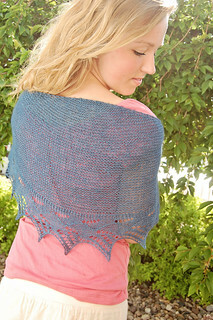 The shawl starts at the top center and is worked outwards. There is increasing happening every row, giving it a nice crescenty shape. I love love love knitted-on borders, and this one was so fun to knit. Completely addicting! 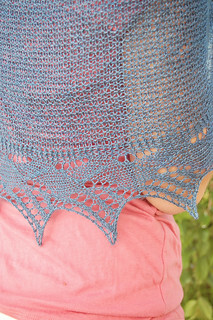 This shawl turned out beautiful and the pictures turned out even more beautiful thanks to Jill and her mad photography skills! Hope you enjoy this new pattern as much as I do! I mentioned what seems like forever ago that I was making a Hitofude cardigan. I started it, and then promptly got sick of knitting it. It sat in the project bag for a month (or two or three) until over Memorial Day weekend when I was looking for something to work on while on the trip to Ohio to visit Alex's relatives. I'm so glad I picked it back up. Once I got through all the lace repeats for the sleeves, I got my cardi mojo back. I have been knitting a few rows on it each night now. This sweater is sooo interesting to knit. You start with a provisional cast on and then work the sleeves/back in a flat rectangle. Then, you 3-needle bind off the sleeves and KNIT IN THE ROUND (that's all in caps because it blew my mind that you had to do that) in ribbing for a few rounds to do the neck and waist. It's back to knitting back and forth and you start increasing slowly (which is where I am now) in the fronts to make the cardigan all drapey and swingy). 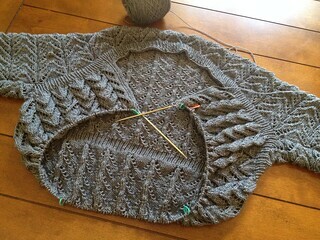 Hopefully in another week or two I will have a finished sweater to show you (just in time for summer, of course).